Access All Areas members are being treated to a brilliant set of design resources from Wing’s Art and Design Studio this week. 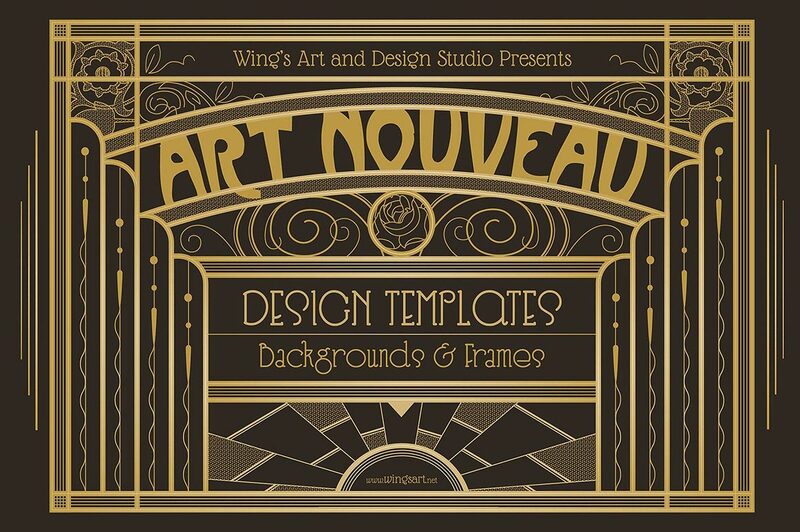 This collection of 8 Art Nouveau backgrounds and frames are fully customisable templates that take their inspiration from the classical architecture and shop fronts of Paris. Pre-set text paths, fully editable vector elements, and a ‘building block’ approach make these templates as simple as possible to use. In just a few clicks you can completely change the colour scheme from dark to light and truly make these designs your own. Use them to create vintage themed posters, menus, party invites, presentations, adverts and so much more! Wing’s Art and Design Studio is home to a wide range of ready-made design assets made by the freelance Illustrator and Graphic Designer, Christopher King. The perfect resource for digital creatives, you’ll find customisable vector artwork, design templates, seamless patterns, brushes, textures and much more; all ready to download and use in your own projects today. Try these amazing free trial versions of the most popular Wingsart products, and follow Christopher King on Instagram to stay up to date with the latest Wingsart updates and releases. This set Art Nouveau Backgrounds and Frames is now available for Access All Areas members to download. The pack contains 8 fully editable design templates for Adobe Illustrator (also compatible with Affinity Designer) and Adobe Photoshop, along with a bonus cover design in landscape and portrait layouts. All the raw artwork graphics have also been saved individually, so you could use the assets to build your own art nouveau inspired designs. Thanks for the kind words guys. I’m thrilled that you’re enjoying them. Feel free to message me with examples of how you’ve used them. I always love to see how my products are put to work by other creatives. You can find me at http://www.wingsart.net Enjoy! This is gorgeous! Thank you so much for this! Its not only only gorgeous, its too too away-some dear. Thanks.